I get it. I really do. You think gluten-free baking is difficult and never all that awesome. I've been there, but not lately. Lately, I've been busy eating these scones. Here's the deal: They taste just like gluten-full scones. You know, the kind you used to make with regular old all-purpose flour (or maybe whole wheat flour if you were feeling wild). But it's not all about the taste, is it? Texture is where it's at. These scones have the same tender (but not chewy), satisfying (but not heavy) texture as wheat flour scones. And there's a yummy cinnamon glaze (frosting for breakfast!). I love them. Read on for the recipe! What does this have to do with FODMAPS? Along with being GF, these scones are also low-FODMAP and hunky-dory for the elimination phase. The low-FODMAP diet is not necessarily a gluten-free diet (and GF does not equal low-FODMAP...stop my head hurts), but if you want tasty baked goods while keeping FODMAPs in check, GF recipes are going to get a lot of play in your kitchen. 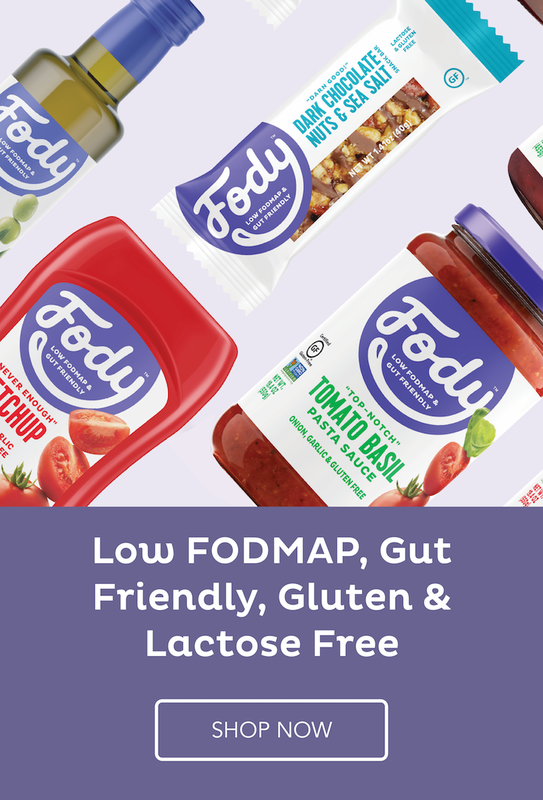 It's wheat that causes tummy troubles for gals like us, so what's really important is that the GF recipes you use don't contain sneaky FODMAPs like dairy or honey. 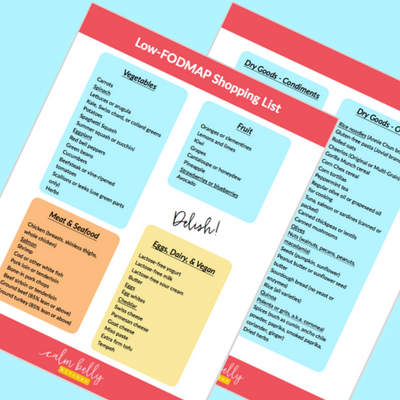 All the GF recipes on Calm Belly Kitchen are low-FODMAP, so you have nothing to worry about here. Just sayin'. 1) You absolutely, positively MUST use xanthan gum for gluten free baking or your cupcakes (or scones, or whatever) will literally crumble into little pieces when you touch them. 2) Xanthan gum is totally not necessary as along you use 12 different GF flours and substitute by weight in gluten-full recipes. As long as those gluten-full recipes are perfect and tested by a collective of talented recipe developers. And as long as you sacrifice 3 goats to the god of ratios at each full moon. Okay, so #2 is slightly exaggerated. The not-so-clear-cut truth is that you DON'T always need xanthan gum to make lovely scones. I've done it (and I'll share that recipe with you too). But if you want a scone that could fool any gluten lover, xanthan gum is your new best friend. So what's with all the grams? Are you European? I'm not European, but I do strongly encourage anyone who bakes to measure ingredients by weight. It's even more important for gluten-free flours because you'll be using a mix of them (so weighing saves you time), and 1 cup of brown rice flour does not weight the same as 1 cup of almond flour as 1 cup of tapioca flour. I think pre-mixed GF flour blends are great and convenient (King Arthur's multi-purpose GF flour is my go-to), but I prefer mixing individual GF flours. Why the extra hassle? Because I can use whole grain flours like millet, cornmeal, sorghum and oat to boost the nutrition. Pre-made blends usually contain a higher percentage of starches (like potato and tapioca) and rely heavily on rice flour. In other words, not a powerhouse of fiber, vitamins and antioxidants. However. You can substitute all the GF flours in the recipe for the same amount (in grams) of your blend of choice, like the King Arthur I mentioned. GF baking is complicated (and we'll talk more about it for sure). But tasty FODMAP-free baked goods are flipping priceless. So tell me, do you have an awesome recipe for gluten-free scones? I want it! Leave a comment, email me or send me a letter if you're feeling fancy. And if you like this recipe, will you share it with a friend? You're the best! Just like a big oatmeal cookie! I cannot tell the difference between these scones and the wheat flour version I've been making for years. Best gluten free scones ever! You can definitely double this recipe (see notes below). 1. Preheat oven to 350F. Spread oats on a large rimmed baking sheet and bake until lightly toasted, stirring once with a spatula, 5 to 6 minutes. Raise oven temp to 400F and measure out a piece of parchment paper that you'll use to line the same baking sheet for the scones. 2. In a large bowl, whisk together the first 10 ingredients (through xanthan gum). In a medium bowl, whisk together the egg, milk and vanilla; set aside. 3. Add the cold butter to the flour mixture. Using a pastry blender (or a fork, or your fingertips), work the butter into the flour until you have a coarse, sandy mixture with chunks the size of small peas. Stir in the oats. Add the egg mixture and raisins and stir until dry ingredients are moistened. Sprinkle a cutting board or work surface generously with rice flour and scoop the dough onto the flour. With floured hands, knead dough into a ball. If a good amount of dry crumbs of dough still remain, drizzle with a few drops of additional milk to help incorporate them (be super-conservative, as it is very easy to over-hydrate gluten-free dough). 4. Press the dough into a thick disk and use a rolling pin to roll into a circle, about 3/4-inch thick. Dust the dough and rolling pin with flour to prevent sticking. Cut dough into 6 wedges. Line the baking sheet with the parchment paper and transfer the wedges to the baking sheet, leaving a few inches of space between them. Bake in the center of the oven until edges are light golden brown and a toothpick comes out clean, 14 to 16 minutes. Rest on baking sheet 3 to 5 minutes, then transfer to a wire rack and cool completely. 5. Stir the glaze ingredients together in a small bowl. The consistency should be thick but pourable. Add more powdered sugar or milk if needed. Drizzle glaze over cooled scones with a spoon. I like to allow the glaze to set before serving, but it's up to you! Since glazed scones are a multi-step process, I like to bake and glaze them the day before. After the glaze sets, I freeze them in a ziploc freezer bag. The next day I defrost at room temp for 30 minutes to an hour, and they taste perfect and fresh. They keep in the freezer for 6 to 8 weeks. To substitute an all-purpose gluten-free flour blend use 100 grams in place of the brown rice flour, millet flour, tapioca flour and potato starch. Rolled oats are sometimes called "Old-Fashioned." Don't use quick, instant or steel cut oats.I use white granulated sugar, but you may sub any type of sugar as long as it is a 1-to-1 substitute.